Long hair is an evergreen trend. It never goes out of trend and market style. It makes you look feminine and stylish. Hairstyles for long hair, as many think is not very difficult. It was ages back that they are difficult to make and work upon, but now there are several simple hairstyles for long hair. In case you like long hair, worry not now you do not need to chop it off. You can embrace the long hair still and work on different hairstyles for long hair easily with yourself and with your friend’s help. Having long locks is as feminine as you get. Typically, people with hair that is longer than their shoulder can be said to have long hair. Since the age of time, long hair has been the most desirable feature in a woman. In India, it was offensive for a woman to even think about chopping her hair off. But these days in our country, so many women are cutting their long hair off for convenience whereas the women in the west are embracing their long locks. What we need to understand is that long hair can be just as natural to manage as short hair and it is much more versatile. You don’t have to wear it open at all times. You can wear it in several infinite ways to suit your mood, outfit and can even switch it up according to the weather. Let us see the 50 best and latest hairstyles for long hair here. That you can do on a long hair and telling you how to do them. This best hairstyle for long hair is very easy to look one can try out for. The knotted ponytail is very easy for those with long hair on several occasions. This style is among the easy and good hairstyles for long hair for girls and women. Leave that knot at below of your head and keep the knots in a place so that it looks like a ponytail. Now leave both parts in a knot and tuck it with a pin so that it won’t mess up. As shown in the picture, leave it as an open ponytail. This style suits for round, square, oval, and diamond faced people. The best occasions for this style is colleges and parks for an evening walk. Short skirts, trousers, and casuals will suit best with this hairstyle. Teens can carry this style confidently. Summers and spring season is the best season to wear this style. This braided hairstyle bun is super easy and trendy to make. This amazing hairstyle for long hair is well suited for those with long straight hair and is easy to make. One does not need to have a lot of time in case they know how to tackle and handle the hair with pins. Split the hair into three equal parts, and make three braids. The twist should be tied lightly for making it look messy and natural. Now do a small and regular braid using the first strand as shown in the picture. Later, braid the other two sections. Now, continue to pick up the middle braid and take out some hairs from the twist so that it loosens up. Now roll the braid like you are making its round bun. Pinout the bun with the pin so that it intact in a position. Repeat this process. And continue it with two other unbraided ones also in the same way. This hairstyle is a good style for round and heart-shaped faces with medium to long hair length. The ideal occasion would be weddings and parties. This style looks good for all age groups, even for older mature ladies. Best season to wear your hair like this would be summered for optimum comfort. Wear this hair with sarees, gowns and dresses. This crown hairstyle is super easy. It is for those who do not have time and are in quick need to do comfortable yet trendy hairstyle. In case you want to know how to make long hairstyle, watch this out. After combing the hair, take the two strands of hair from both sides near ears. The strands should be less in volume and leave the rest of the hair as it is. Now equally divide one of the strands, start making a braided ponytail, and secure it with a rubber band so that it will not detangle. Repeat the same process with another hair strand. Now comb the hair at the head mountain leaving those strands and tuck those hairs after giving it mountain shape at the back near the neck as shown in the picture. You can use the hair spray to keep the mountain shape of the hair in place. Now take one braided ponytail from one side, pin it up below the crown for giving the hair mountain shape, and repeat the process with another ponytail. Make sure you remove the rubber bands before tucking those braided ponytails at the back. This hairstyle is ideal for all kinds of face shape. Perfect occasions for this style is college parties and outings. Wear this style with casual dresses, midis, and party dresses. Any girl between age 22 to 35 can wear this style. Summers and sunny days are the best time to wear this style. This hairstyle is an improvised version of the basic braid. Now here is the answer on how to style long hair easily in the form of a stylish braid. Check this out. Now start making regular braid from those equally separated strands. Now, look at the picture given above. 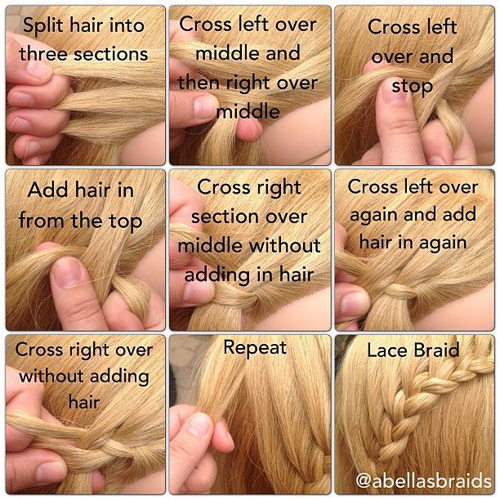 Take some hair from the crown of your hair and start braiding a braid. Make sure you cross the hair from the right or left over the middle part, add a little bit of extra hair from the side. This process repeats until the nape of the neck. Then the rest of the hair is braided in the usual way. It is the best simple hairstyles for long hair. Suitable face types for this style is ideal for any face shape with long hair. Perfect occasions for this style works for all events but more for casual occasions and even for home wear as the hair remains protected. Ideal age groups for this is teens and young women. Best season to try this hairstyle works for any season. Matching dresses for this style is casual dresses, long, and jeans-tops. 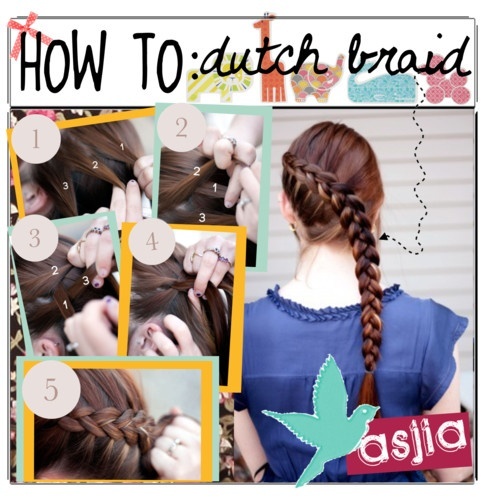 This dutch braid looks very complicated, but it is very easy to do. Hairstyles for girls with long hair may be easy or complex as you may want it to be. But this hairstyle is not so difficult to do as you may have thought. Here, rather than crossing the hair from left or right over the middle part, you pass it under the central part while adding in extra hair from both sides of the head. Repeat the same process here once again, the hair till the nape of the neck. Now continue the process as a regular braid (but the strands going under rather than over). Thus, the hairstyle is ready. Suitable face types for this style is ideal for round face with medium or long hair. Ideal age group for this hairstyle will suit teenage girls. Best seasons to try this style is summer, winter or spring season. Matching dresses for this style looks cute with tees and tops paired with jeans. This hairstyle is perfect for those who are growing out their bangs, or for those who want to keep the hair out of their face. Long hairstyles for girls can be as easy as you may think they are. Follow these steps to achieve this hairstyle easily. Begin and make side part of the hair. Now, take the section of hair in the front, right from where the part is. Split the same into three and French braid, but rather than adding in extra hair from both sides, make sure you only add in hair from the right side and not from the hairline. Comfortably, make sure to angle the braid so that it frames your face. Keep adding in more hair till you reach your jawline. Now do the braiding as a standard braid. Suitable face types for this style is a round face or oval face with short- medium or long hair. Perfect occasions for this style is school or college as it looks nice and keeps hair out of the face. It can also look good for birthday parties or coffee dates. Ideal age groups for this hairstyle is teenage girls more than any other age group. Best seasons to try this style is one of the fantastic long hairstyles for girls which is an all-season hairstyle – practical as well as beautiful. Matching dresses for this hairstyle is smart casuals like jeans, tops, and dresses would look cute. Female long hairstyles are here. It may be as easy as you can see here. This look can be very trendy and simple for several occasions when you are running out of time. Do a side ponytail at first. Take a separate strand from this pony. Make number four shape here with strand and bend it as needed. Take other strand and repeat the same process. Suitable face types for this style is the slender and thin face with medium to longish hair. Perfect occasions this hairstyle is any time, celebratory or casual. Go for this look for wedding functions, college or even for a movie date. Ideal age groups for this hairstyle is young girls and teenage girls. Best seasons to try this style look great in winter, summer or even rainy season. Matching dresses for this style is a salwar kameez or casual western dress, it will look great! 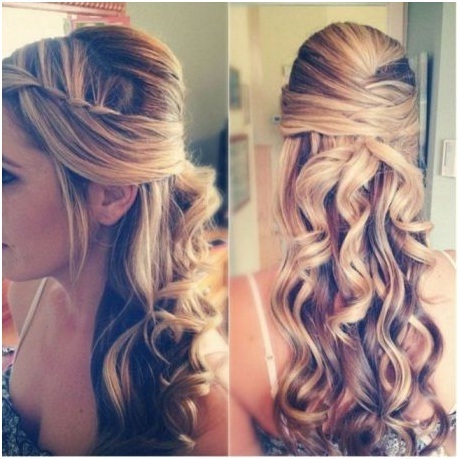 It can be a wedding hairstyle for long hair. This style is perfectly suited as bridesmaid look or any of wedding events and occasions. And it’s so elegant and trendy that it can easily fit in your timeline too. Take a section of the top third part. Split into three parts at first. Do French braid at first with the part. Give cascading effect once you finish one or the two braids out of three parts. Cross from middle and later drop down a hair from the top part. Where you drop, add another strand of hair from the top. Carry this till you want the length of braids. Thus the look is ready now. Suitable occasions for this hairstyle is parties, weddings, dinner dates or birthday parties. Ideal age groups for this hairstyle is younger girls, teenage girls, and college-going young ladies. Best seasons to try this hairstyle is any season, though it is more comfortable for winters and autumn. Matching dresses for this hairstyle is cute skirt tops, dresses, and even dungarees and sneakers. This hairstyles for long hair can be easy and traditional look for several times and occasions. Brush out and untangle the knots. Split hair into five parts. Number them from one to five for easy recognition. Take strand one over the strand two under strand three. Put strand five from opposite over the strand four and strand one under the middle strand. Repeat these steps from all the sides. You can see how this braid is formed. Keep this tight and secure while you braid. Tie elastic once you have a desirable length of braid. This style is ideal for the round, oval, square-shaped and elongated face with medium to long thick hair. Suitable occasions for this style is workouts, walks, dates and even college. Ideal age groups for this hairstyle is younger girls and working women alike. Best seasons to try this hairstyle is humid weather like rainy season but would look equally suitable for any other season too. Matching dresses for this hair with any attire, though workout clothes would go best. Milkmaid braid or Heidi braid is very easy to do. It can be seen as one of the wedding hairstyles for long hair. This style looks so elegant, and you can choose to do it for any of wedding events. Split hair down from middle. 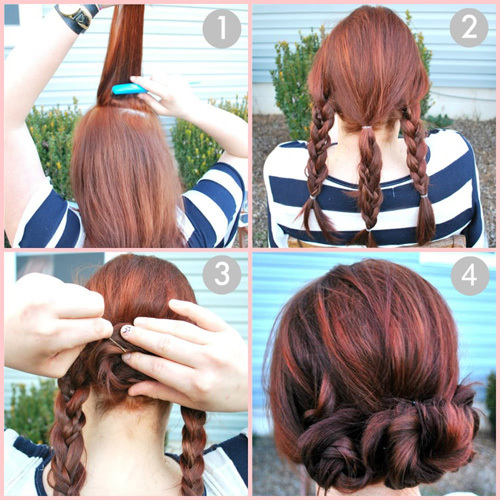 Braid both ponytails and tie it with the elastic. Take two braids and wrap them around the head. Make sure to wrap like a hairband. Tuck both ends underneath and use a generous amount of bobby pins. This style is ideal for round, oval, square-shaped or an elongated face with long hair, thick or thin. You can use this type of hairstyle for formal programs like opera, theatre, red carpet events and also for plays. This hairstyle suits older women of age group 20 years to 30 years. Best seasons to try this style is a good summer hairstyle as the comfort on the nape of the neck is high. Matching wear for this style is gowns, long dresses, bohemian attire, and long flowy skirts and also with smart cocktail dresses. This hairstyle is a no braided your hair only brush your hair. It looks simple and not at all time-consuming. It is one of the easy and best hairstyles for long hair at no time and effort. Spray it for keeping it intact once. Put hair as ponytail above. Grab the hair at the end and roll it like just like the bun. Tuck the bun around and pin it with bobby pins all around. This hairstyle is ideal for thin face or oval face. One can use this hairstyle for any occasion, but it looks adorable for weddings and other formal events if appropriately decorated with jewels and flowers. This hairstyle suits young girls and older women too. Best seasons to try this hairstyle is suitable for winter and summers both. You can wear your smart formals, sarees, wedding clothes and also gowns with this hairstyle. Another basic hairstyle that every girl should know is the basic bun. It is comfortable and best suited for several formal and informal occasions as well. Gather all hair in the hand. Position it and place as high or as low as you want the bun to be located at. Hold it tightly and place elastic. This style is ideal for any face shape with medium to long hair length. You can make this kind of hairstyle for meetings, weddings, seminars, presentations and also for office events. This hairstyle will suit working women and older, more mature women too. Best season to try this style is great for summers. They are very comfortable for any other season too. One can wear this hairstyle with office formals, wedding attire, and smart long dresses. This hairstyle is one of the most feminine hairstyles, as of now. It can be best suited as either straight or curly hairstyles for long hair. Gather hair from each side of the head, in hand at first. Split the loop into two and pin one of the loops with holder. Spread it and pin with bobby pins. Repeat same on another side of the loop. Remaining hair of ponytail can be taken and wrapped around the centre as a bow. This hairstyle looks great on round or oval face with shoulder length hair or beyond. You can use this hairstyle for casual outings and movie dates or evening outings. This hairstyle suits teens and young women. Best season to try this style is any season and look beautiful at all times. Try this hairstyle on jeans, kurta-leggings and skirt tops for a casual and fresh look. 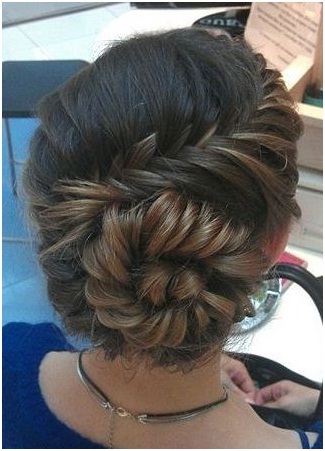 This style is another version of the braided bun. And it is the best as hairstyles for long straight hair. Put a sleep ponytail on hair up. 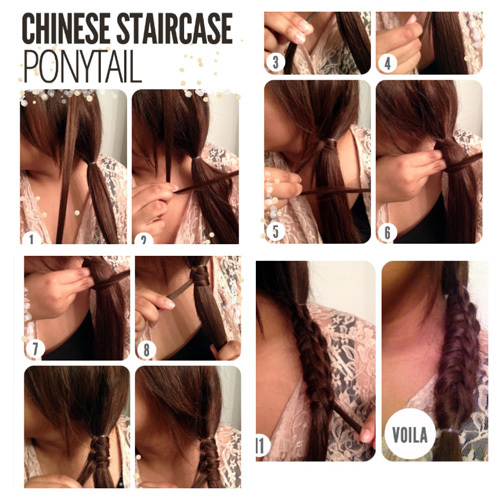 To braid small strands from the ponytail and secure ends with elastic. Wrap the braids around the base of the ponytail. Make sure to form a knot on top. Thus, the bun is ready. This style works well for an oval or thin face with medium or long hair– medium and can be straight or wavy or anything. Use this hairstyle for parties, work outings, meetings or weddings. This kind of hair works best for older women, working women and new adults. Hairstyles like this are good for summer, but you can also wear in other seasons. Team this hairstyle up with formals – work-wear or otherwise. This style is very chic and sophisticated, but easy down does. One can easily do this hairstyle as it is not as complex as it seems. Gather all hair to ponytail form. Pull elastic down and flip your ponytailed hair. Tease the hair a little to give messy form. Tuck it as seen in the picture after gathering the hair. Secure it with bobby pins well. This style is ideal for any face shape with long hair length. You can make this hair for formal events like weddings and ceremonies. This hairstyle looks good on women of all ages. This hairstyle is not a season-specific hairstyle so can be worn in any season. 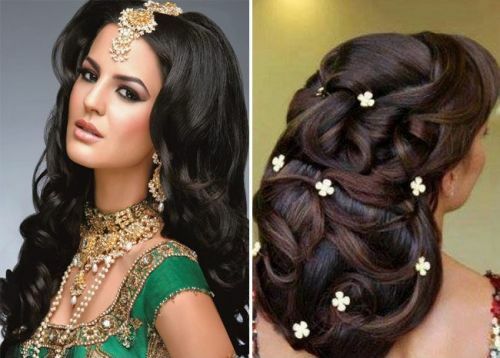 Wear this hairstyle with your wedding best – clothes with bling, sarees, heavy suits and also lehengas. This style is the best hairstyle for long thick hair. It is a bit complicated but is chick and stylish as it can get. Do a side ponytail behind the ear. Split hair into three parts. Make sure the middle strand is less thick than sides. Take side strand and brush it thoroughly. Wrap it over around palm to form a loop. Pinto the back of the head with a lot of bobby pins. Make sure to place it in a crisscross manner. Do same on another loop. Take a middle strand and wrap it around the middle. This style is excellent for long, and thing faces as it takes the attention off from the length of the forehead. Hair length needs to be long enough. You can make this hair for formal events like red carpet parties and weddings too. This hairstyle suits young women of 20 to 30 years of age. This hairstyle is suitable for any season because they are for parties. You can wear this hairstyle with long or short cocktail dresses, sarees and party lehengas or indo-western dresses too. 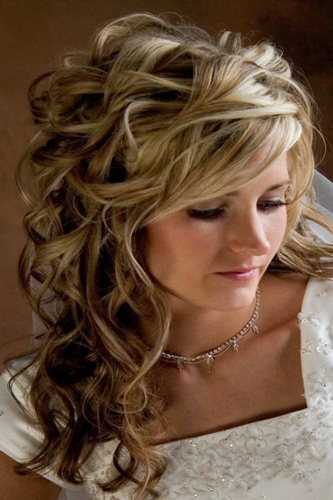 An ideal hairstyle for weddings, especially for brides, this hairstyle looks lovely and full and suits almost anyone! This one is the most popular wedding hairstyle for long hair. Follow this tutorial to get the hang of the seemingly tricky look. Take the crown side of the hair and brush tease it well. Spray the top side part of the hair. to split rest of hair into two equal halves. Make regular braids and secure their ends. Take braids and wrap them around the head. Make hair bands kind of wrap and secure them. This style is ideal for round and heart-shaped face with long or medium-long hair. 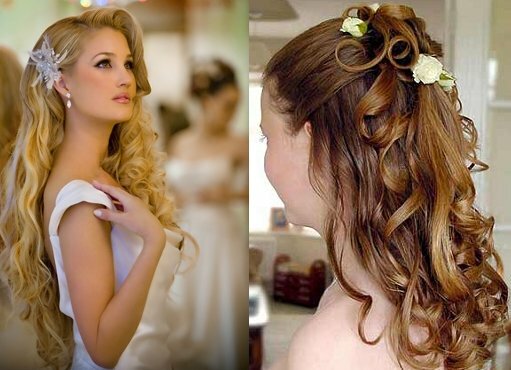 Perfect occasions for This hairstyle is only weddings! This hairstyle will suit young or older women more than teens. Winters and summers both are suitable for this kind of hairstyle. The wedding dress is ideal for this hair. But if you are not the one getting married, go for formal gowns or short cocktail dresses. This hairstyle only looks so great with thicker hair. This hairstyle is one of the celebrity long hairstyles which is easy to do. Put your hair up as ponytail above. Make ponytail into two parts. Twist the parts around until the end part. Twist around the base side. This style is ideal for any face shape but thick with long hair. You can make this hair for office and coffee dates – basically any casual outing. This hairstyle will suit any age of females. Best seasons to try this style is suitable for summers generally, but also look good in rainy season. Matching dresses for this bun is casual clothes, jackets, and even dresses! The upside down French braid bun is a very interesting take on the classic hairstyles. It may look complicated but is not as you think, it is elegant and gives a vintage look. This style is one of the best hairstyles for long hair. French braid from nape of the neck, till crown side. Once you reach the crown side, gather other hair and make a bun. Decorate the hair with flowers, preferably white flowers. This style is ideal for heart-shaped face, square face and simple round or oval faces with the hair length is medium or long as ideal. It’s a semi-formal hairstyle appropriate for office outings, engagements, etc. This hairstyle looks good on teens, young women as well as older women. The best season for this type of hair would be spring and rainy seasons. Team this dreamy hairstyle with flowy gowns and long skirts and even with skirt-suits for a relaxed and chic look. If you are wondering how to make hairstyles for long straight hair, we have the solutions! This very cool hairstyle is as quirky and fun as can be. The boho style of hair is ideal for garden or forest weddings or whimsical outings with a twist. This hairstyle involves fabric strips, and you can get creative with the kind of fabrics you want! Here is a stepwise procedure for this hairstyle. Wrap a thin scarf around the head. Make sure you place like a headband. 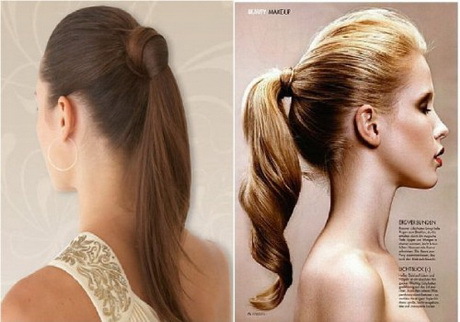 Make ponytail to hair, sleek and high. Take two strands and make messy buns and pin them. Tuck them into a scarf at sides. Use bobby pins to pin properly. This style is ideal for all face shapes with short, medium or long hair! Pick this hairstyle for theme weddings, theme parties, tea parties and the like. Great for young women and older women too, this hairstyle looks great if done correctly. Spring is the best season for this kind of hairstyle. Pick out your bold floral dresses, cottony – summery sundresses, and long skirts and hats to go with this hairstyle. This style is among those of the best hairstyles for long hair. It looks elegant and also modern and helps you stay free in a long working day as well. This hairstyle is as easy as can be, and yet looks superb because of the finishing it provides to the hair. It seems like it is done in a salon! Here are some steps to make this bun with finesse. Cut off and take the front part of the sock and roll it tightly as if you are doing a bun. Put hair up on ponytail. Insert sock bun at the end of the ponytail. Pull and wrap hair around the sock. 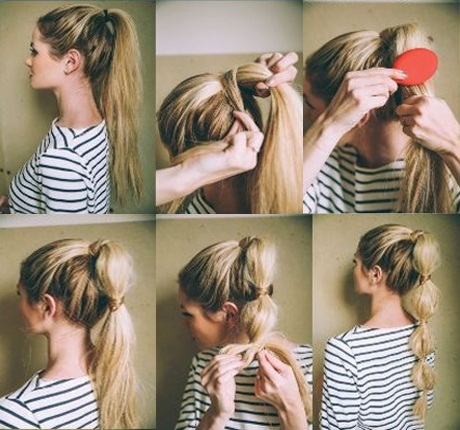 Do this till you manage to reach the base of the ponytail. Keep bobby pins to secure properly. This style looks best for oval and thin faces but can also be worn by other face types. Suitable occasions for this hairstyle is anywhere to try! It looks good for any event. This hairstyle will suit young adults and older women too. Best season to try this hairstyle is any season because it is very versatile. Team sock buns with western or Indian wear and complete the look! Buns are sophisticated and fun at the same time. That’s why they are the perfect choice for most women for any occasion too! If the hair is an appropriate length, buns are the best way forwards for minimal effort. This double rope braid bun is fun and stylish also and here is how you make it. Make rope braids with both parts. Secure with band end of the ponytail in both sides. Twist first rope braid and secure the end. Now twist the second one and pin it against inside the first rope braid. 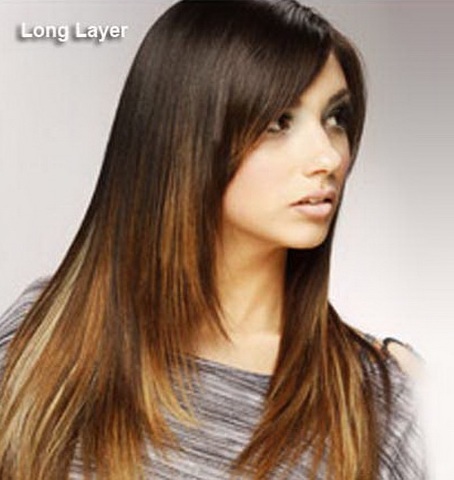 This style is ideal for round or oval face shapes with long, medium thickness hair. You can make this style for weddings, dates, dance programs and school or college gatherings too. This hairstyle is suitable for all age groups of women! Best season to try this bun for summer weddings. This hairstyle is a chic bun for the charming woman of today! It looks sleek and powerful and yet is quite simple to create even from medium or short hair. Take two parts of hair, one part having two third of the hair. Tease lower side of the third and give volume to the part. Make a sleek side bun with that. Pin it off with secured pins. Take the upper side of the hair and make side bun. Pin again underneath with bobby pins. Spray properly to hold the bun on the place well. This refreshing style is perfect for round or oval or square-shaped faces with any length hair barring very short. Suitable occasions for this hairstyle is office parties, red carpet events or even board meetings. This look works for older women who can carry it with more power and intimidation. Best season to try this hairstyle for any season wear. Pair it with your sleek power-suit, corporate wear and office wear for a professional look. Such a fresh style to decorate one’s hair with! Such a fun girl’s long hairstyle! It looks complicated and might even be for novices but not for girls who like to experiment with their hair. Make fishtail braid firstly on one side of hair. Make the look braid bigger. Tuck the braid well into a bun shape. This style looks great for oval and thin faces with medium to long hair. You can make this hairstyle for proms, farewell parties, weddings and also for dates. This bun hairstyle which looks better on older women, but teen girls may also try for a different look. Best seasons to try this style is a season independent hairstyle which will look beautiful in any season! Pair this hair up with gowns, wedding clothes, sarees, anarkalis, and lehengas too! An evergreen and one of the best hairstyles for girls with long hair; the French twist is a wild hairdo which is equally nostalgic as it is modern. The French twist is reminiscent of yesteryear actress like Bridgette Bardot. Section separately first top of one-third hair. Take bottom and twist the hair on one side. Pinto the back of head tightly. Now take op one-third of hair and twist it well. This style is ideal for any face shape with medium to long and medium thickness hair. You can use this hairstyle for any casual or formal event. The appropriate age range for this hairstyle would be 20 years and above. Best season to try this hairstyle looks great for any season! Team this hairstyle with gowns or dresses or sarees and lehengas. The flower braid looks like it took hours to make it look this great, but in fact, it only takes minutes to complete this look. It seems elegant and unusual and so organic! Take hair from both sides of the heads. Tie the ends with elastic. Make single braid now and tie again. Flatten the braid and turn into a circle. Pin it to give a look like a flower. Suitable face shape for this style is a round or elongated face with long wavy hair. Since it is such an organic and earthy style, you can wear it to picnics, walks, dates and also for gatherings or music events. The ideal age groups for this hairstyle would look great on younger girls and teens. 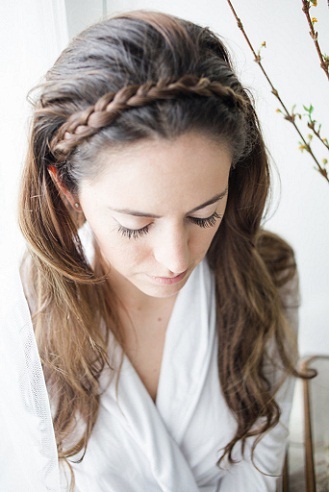 Best season to try this braid is summers and springtime. Pair this style with flowery dresses, casual cotton, Kurtis and also skirt tops. It looks the same like basic trade; however, you generally take hair on one side and start to braid loosely. This hair looks so organic and regular yet elegant. It is best for several summer hairstyles. This style will suit on diamond, oval, square, round and oval shaped face. Women between the age of 16 to 32 can wear this style easily and comfortably with confidence. Jeans, t-shirts, skirts, traditional Indian, and casual dresses suit well in this style. A suitable occasion to carry this is casual outings, colleges, schools. This style is one of the best and basic hairstyles for long hair. It is easy to make and not at all complex yet looks so soothing and comfortable. Make hair to three parts A B and C. take A over B and take C over A and then B over C. repeat this till you finish braid. This style will suit on diamond, oval, square, round and slim shaped face. Suitable for summer season and fall season only. Women between the age of 16 to 32 can wear this style. Party wear gowns suits well on this style. One can also wear traditional dresses. A proper occasion to carry this is the bride’s maid. This braid looks easy and elegant to do. One has to split hair into two parts and take a small amount of hair from underneath and cross over the second part. Then take from the second part and cross on the first one. You have to repeat this process. This style will suit on diamond, oval, and slim shaped face. Suitable for the summer season only. Proper occasions to carry this is casual parties, colleges and evening events. This hairstyle is as basic as it gets. Simple split your hair into two and tie it down using two elastic. You can tease your hair to give it more volume before putting it into pigtails. Loose pigtails are the perfect hairstyle for long hair. Summer season is the best for this hairstyle. Women between the age of 16 to 25 can wear this style. This smart look is best for formal wear and also party occasions. It is best and easy hairstyle to do within less time. If you are not quite sure about how to style them, then this is for you! This style is also very easy as what you just have to do is start with a normal half up- half down style but make sure to make a nice puff on the crown to create that perfect bouffant and then pin it normally. Let the rest of the curls hang loose. Suitable seasons for this hairstyle is summer only. Party wear dresses, traditional Indian, and casual dresses suit well on this style. Proper occasions to carry this style is casual outings, picnic, events, and church. Long hair is an advantage, and you do not even need to think much about haircuts for long hair because you can style it in any way you want. You can do this formal hairstyle easily when you have long hair also. Here you need to simple braid your hair from both sides into a French twist and then simple pin up the twist when it reaches the back of your head from both sides and let the rest of the hair hang loose. This style will suit on diamond, oval, and slim shaped face with long hairs. Perfect seasons for this hairstyle is the summer only. Deep neck dresses skirts, traditional Indian, and casual dresses suit well on this style. Proper occasions to carry this is casual parties, and evening events. This hairstyle is the hairstyle for long hair which is a modernised version of the simple milkmaid hairstyle which has already been mentioned in the list before this. In this one, you simply have to take hair from one side of the head and then start braiding it normally and then take it over your head like a hair band. Now pin it on the other side and let the rest of the hair hang loose and do the rest of the talking. Summer is the best season for this hairstyle. Jeans t-shirt, traditional Indian, and casual dresses suit well in this style. When it comes to different hairstyles for long hair, you just cannot miss the simplest look of all. It’s when you leave your hair loose without trying it in any way. This style is just brushing your hair nicely and then leaving it just like that. Best seasons for this hairstyle is summer season. The simple pin-up is one of the easy hairstyles for long hair and is one of the most popular as well. In this one, you just comb your hair really well and then leave it loose and simply pin-up by folding any part in the front of your choice. It happens best when you have long fringes, and you want to look neat. You just take your fringe, fold it up and then pin it up on the head. This style will suit on diamond, oval, round and slim shaped face with long hairs. Suitable for summer season very well. Women between any age can wear this style easily. Deep neck dresses, skirts, traditional Indian, and casual dresses suit well on this style. Suitable occasions to carry this is casual parties, college and evening events. Simplicity is the best way to express your inner beauty, and this is likewise one of the simple hairstyles for long hair where no styling is required absolutely. In this one, you get your hair cut in the layered version and then simply let it do all the talking. This style will suit on diamond, oval, and slim face with long straight hairs. Suitable for monsoon and winter season well. Women between any age can wear this style. Traditional Indian and casual dresses suit well on this style. Proper occasions to carry this is casual parties, colleges, temples and evening events. This style is an oh-so-romantic one among all the hairstyles for long hair because this is one of the best suited for weddings and receptions. In this one curly hair is the most suitable and you don’t need to work on that too much. Here you just need to comb your hair just a little bit and then pin waves randomly as you find in the picture. Suitable for this hairstyle is winter season only. Women between the age of 20 to 32 can wear this style. Deep neck dresses skirts, traditional Indian, and casual dresses or gowns suit well on this style. Proper occasions to carry this is evening ball party. You can also style while going outing with friends. The name says it all for this one it is one hairstyle for long hair which is one of the most common for the brides who are all confused on their wedding day. This style is extremely easy, and you can even do it without any help. This style will suit on the diamond, oval shaped face with long hairs. Suitable for this hairstyle is summer and monsoon seasons. Women between the age of 20-35 can wear this style. Proper occasions to carry this is casual parties, and wedding. For the curly hair girls out there, this is one of the most beautiful haircuts for long hair, and the best part is that this haircut goes well with all that you would like to wear. You can easily leave the hair loosely and be your best. This style will suit on diamond, oval, round and slim shaped face with long curly hair. Women between the age of 20-37 can wear this style. Deep neck dresses skirts, jeans and t-shirts, traditional Indian, and casual dresses suit well on this style. Suitable occasions to carry this style is parties, fashion shows. This hairstyle is mainly for ladies who have extremely long hair. You can just think of Rapunzel, and this hairstyle will become clear for you. Here this is a single braid, and the haircut is vintage styled. 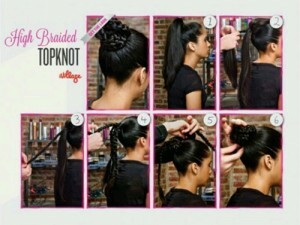 You just have to take all your hair to one side of the shoulder and make a loose and low braid which will hang nicely. The fringes will not be pinned up at all. This style will suit on diamond, oval, square and slim shaped face with long hairs. Suitable for the summer season is the best. Women preferably between the age of 20 to 35 can wear this style. Proper occasions to carry this is casual parties, colleges, picnic and evening events. 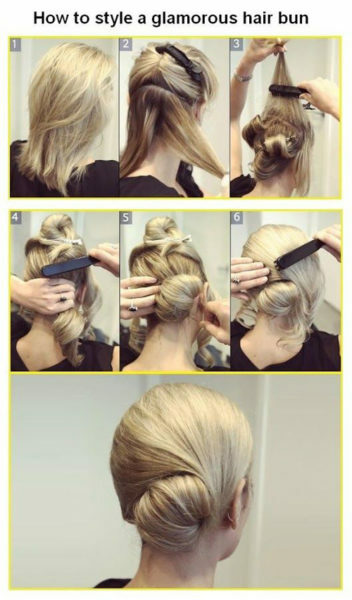 This style is a very easy hairstyle, but it looks very nice for even the biggest of parties and events. In this one, you take your hair to one side, comb it and then tie a side knotted pony-tail like the one you normally do on the back. This style will suit on the oval and round shaped face with long hairs. Suitable seasons for this hairstyle is summer and winter. Women between any age can comfortably wear this style. Deep neck dresses skirts, traditional Indian, and casual western dresses suit well on this style. Proper occasions to carry this is cocktail parties. It looks like this is one vintage style, but he can surely be recreated and flaunted as one of the trendiest on the list because it is different. This style is such a Barbie girl hairstyle, and you can make that out from the photo itself. This style will suit on diamond, oval, and slim shaped face with long hair. Jeans and t-shirt, traditional Indian, and casual dresses suit well on this style. Proper occasions to carry this is dance shows, and events. 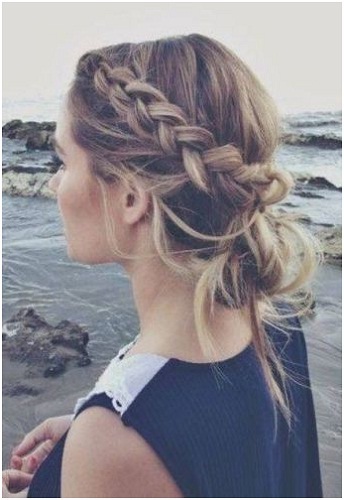 It is a new hairstyle for long hair and a fusion of the Dutch braid and also the waterfall braid. This style looks magical from a way because from a distance you will just be able to see a braid from the middle of loose hair. In this one, you have to take thin strands of hair and make a braid from the middle of the hair as if you want to hide the beginning and end. This style will suit on diamond, oval, and slim shaped face with long and straight hairs. Suitable for monsoons and winter season only as it may be irritating during summer. Women between the age of 16 to 35 can wear this hairstyle for long hair. Proper occasions to carry this is casual parties, college and evening events. Accessories and especially accessories for the hair are some of the most common things girls use to make their look better. Even in this picture, you will be able to see that there is an excellent detailed accessorising done on the hair. Also, those curls look super creative, and the level of art in this hairstyle is amazing. All seasons are suitable for this hairstyle. Deep neck dresses suit well on this style. Proper occasions to carry this is parties. These are for the girls who like modern and do it with attitude. First of all, it is highly risky colouring all of your hair in wacky colors, and it is even riskier to use so many colours. This one is surely not a common one, and a lot of people may find it extremely weird too, but in case you would love to go through this wild phase of style, you are most welcome. Suitable seasons for this hairstyle is winter season only. Women between the age of 16 to 30 can wear this style. Casual dresses suit well on this style. Proper occasions to carry this is music concerts or DJs or clubbings. This hairstyle has both waves and a knot at their own places. This style is just another version of the knotted ponytail. The only difference is that over here first you do a knotted ponytail, and then you twist your hair to make it look like a spiral roll. The picture will show you exactly how. This style will suit on the diamond, round, oval, and slim shaped face with long hair. Deep neck dresses skirts, and casual dresses suit well on this style. Proper occasions to carry this is casual parties, and corporate offices. This hairstyle is a difficult but one awesome hairstyle you can rightly use for a wedding or maybe for your own wedding. Talking about Arabian princess this can be suitable for a princess from any place in the world. You need to take some help from a professional if you want this hairstyle done at least for the first two times. Women between the age of 25 to 32 can wear this style. Traditional Indian, and gowns suits well on this style. Proper occasions to carry this would be a wedding (for the bride). This style is a very simple hairstyle where curly hair is the most suitable. In this one, you can make a simple low pony and then fold it in a way that it looks creative. Also, you can create extra curls all over the hairstyle to give that rosy and arty look. Suitable seasons for this hairstyle is summer season only. Women between the age of 22 to 32 can wear this style. Deep neck dresses and wedding dresses suit well on this style. A proper occasion to carry this is weddings. It’s one hairstyle which looks very gorgeous, but you need a perfect amount of hair in your head for this one. Here you need to start by the side parting your hair. Now from the side where you have put more hair start braiding it. Once done you can continue to braid on that very side till you reach the end of the hair absolutely. In the course, you can either take all your hair or maybe a part of the hair. It’s a simple and easy hairstyle for long hair. Women of the age of 20 to 35 can wear this style. Suitable occasions to carry this is casual parties, and college. A rage with teenagers and college goers is now to experiment with haircuts and makeover. 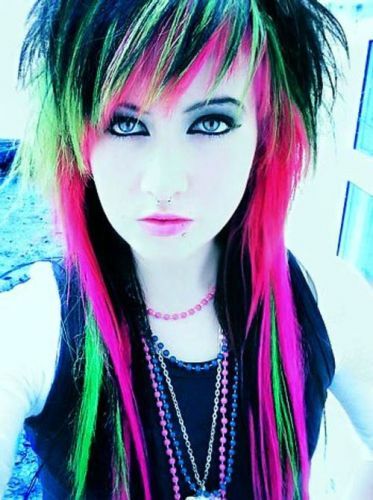 This style is one such example where the girl has long hair, but the front fringe looks like an emo cut. It seems to be a fusion of two haircuts, and she is flaunting it with some pink hair colour. Does that sound too funky? Well, that is called creativity and all of that! This style will suit on diamond, round, square, oval, and slim shaped face with long hairs. Think about all the times you have spent trying to perfect your bun for that ultimate feel and remember all the times you have miserably failed. With this bun trick up your sleeve now you can never go wrong. Start with a pony and then carefully loop the pony halfway through itself for the sloppy bun. If you are tired of your everyday pony and want to add some spice to it, try this bubble ponytail. Tie the ponytail and then wrap a single lock around it to hide the tie. Now along the length of the pony tie several mid pony ties and then use the locks underneath to hide the band. Fan out the hair if needed. Clearly one of the cutest hairstyle you can use this as an everyday causal hair with a loose sweater and leggings or simply use it as office couture with a blazer and a pencil skirt. 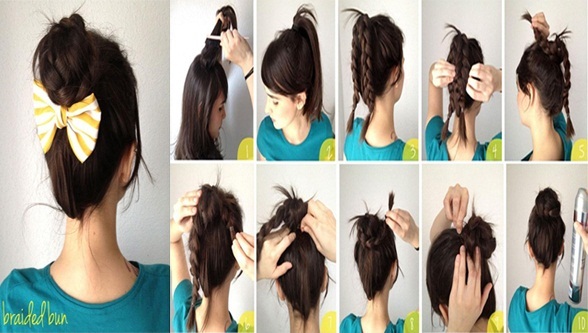 Tie your hair in a ponytail and then segment it into two parts. 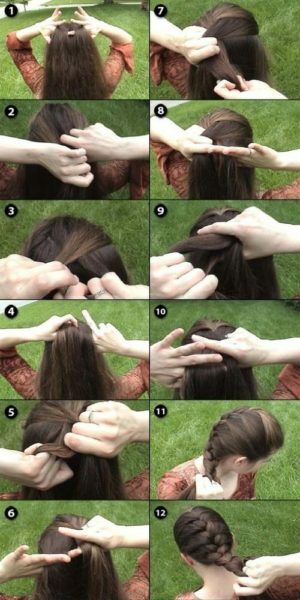 Braid the two individually and wrap around the two in a bun. The name of this hairstyle is derived after the texture of the hairstyle that resembles the plants in a cornrow. The cornrow is a temporary look much like the dreadlocks, in fact resembling the dreadlocks a bit too and it is here that the major trends are set. Usually girls opt for a side of the head where the dreadlocks can be done. This is a perfect look for a wedding or a social occasion for the eve where with a classy stiletto and Chinese collar neckline you can opt for this conch shell bun. The name of course is derived from the shape or look of the bun. Start by infusing French styled braid and fishtail and then fan and roll it into a bun. For the curly head in you, don’t forget to try this awesome hairstyle that comes in rolls and swivels. For this you might need additional curlers. Heat your hair with the heated curlers properly so that the hair can easily be molded into a roll. Now take individual strands and start rolling and pinning them up. This is an ultra savvy pin up technique which looks elegant and fun at the same time. Start by adding a braid at the front and now pull back all your hair and taking individual lock strands pin them up in a zig zag way. This is a simple enough hairstyle that you can use for your everyday office look and at the same time this can be a perfect look for a cafe date with your girlfriends. Start by sectioning a chunk of your lock from the front of your head and now start braiding it. Once done drape it to the other side and pin it down. 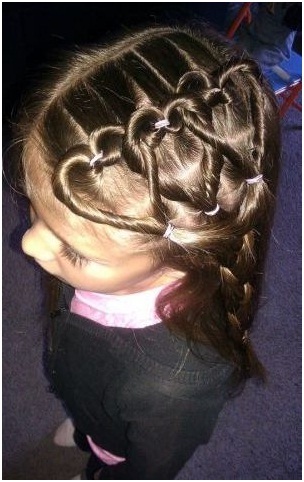 Next time your kid gets bored of her everyday braids, try for this awesome heart shapes and see her friends wow her like no one before. You have always wondered how best you can use long hair to incorporate newer styles in your everyday looks? You have ever wondered how else to spice up your regular pony. This double side ponytail hairstyle is quick and easy to make with small changes, it looks amazing for you. Here are some hairstyle tips for long hair which can help you best to maintain your hair. Use of right brush is critical when your strands are long—it should minimise the hair shafts and reduce breakage. Try to use the natural brush, bristle free, and friction-free while brushing. Try and use hair brush and hair comb both for your hair. First, use a broad-toothed brush to remove any frizzy hair or tangles. And then brush your hair smoothly. This style can make your hair look much smoother. Use deep hydrating technique twice a week to maintain the moisture of hair. You can use the coconut and honey mask on your hair or have vitamin E treatment by using olive oil. For the best result warm the oil in low heat and apply on the scalps then wrap the hair in a heated towel and wash it after 15 minutes. Use the towel to dry the hair but do not rub and rubber band should not pull out the strands from the roots. Long hair is still a trend, who said it is not? It can make you look classy like a boss and make you look beautiful yet trendier. 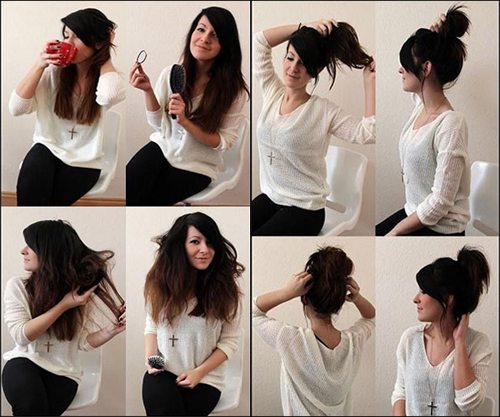 You can either opt to leave your hair open or even tie it in different hairstyles. There are several hairstyles and hair do’s for long hair people, forget not, they make you look elegant. You can easily change your hairstyle as per your costume and occasion, as this is the best option for those with long hair. I hope this article helped you with better information and tips to long hair and hairstyles. Reach out to us on what you think! Q1. How to maintain long hair health? Ans: Maintain medium or short hair is smooth but when talking about long hair, it needs efforts for it. 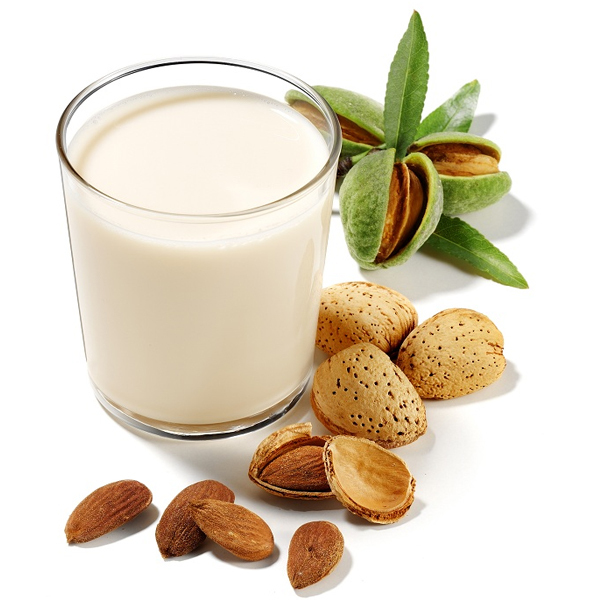 To prevent hair fall, vitamin E should be applied to the scalps, and it should be massaged will before head bath. You can use the hair mask on your hair for natural shine and health. Moreover, you can apply the aloe-vera and honey mixture for dandruff free scalps. Q2. What it’s like to have long hair? Ans: It has both pros and cons, and one should opt as per their choice. Some women love to carry long hair while some prefer medium and short hairs. If you don’t want to tie your strands, then prefer opening it. It will look more attractive and eye-catching. Q3. How to get long hair for men? 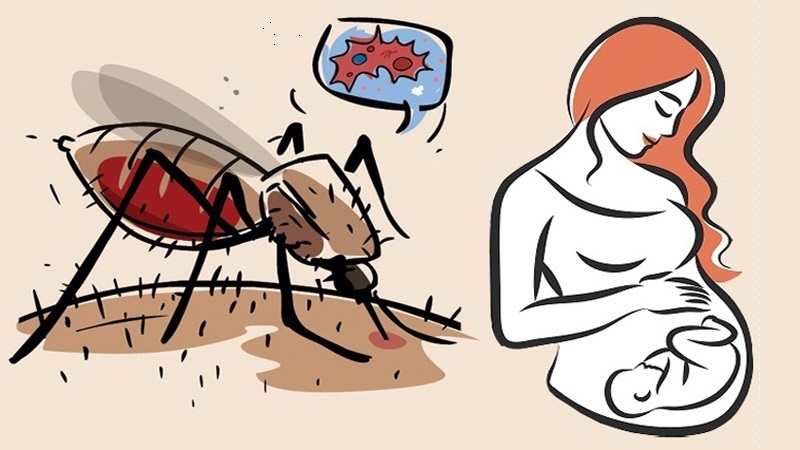 Ans: Do not shampoo it regularly, oil and massage it twice a week; regular trim your hair, use conditioner, don’t rub your tresses, eat protein-rich food, etc. these are the maintenance tips for men for getting the long strands. No doubt, men’s hairs are thick in texture so it will require more time than usual growth.